A break in the weather would be nice. It is cold. Too cold for this couple! That said, the boat is cruise ready and we've even had a "cuppa" on board. Sunday, the 30th, we went out and tested the autopilot which works well now that we remember how to operate it. We took the opportunity to test towing the Nutshell Pram.Tows like a dream. 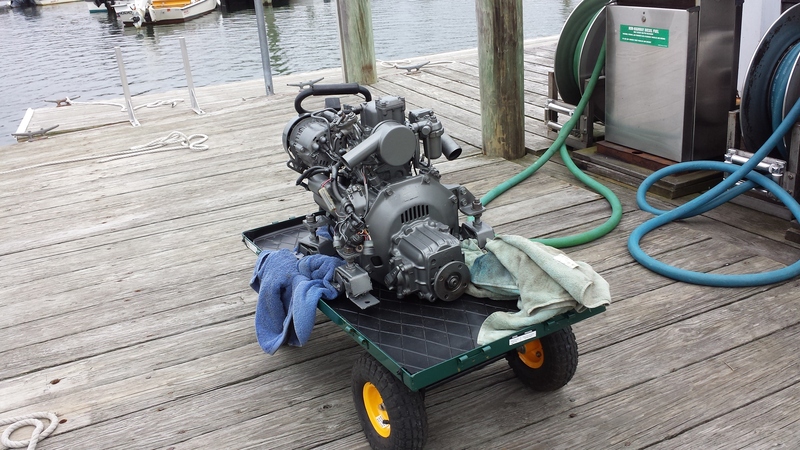 When I get her freshened up after this rough season in the boat yard she will both look and tow even better. On a recent weekend, Grandson Z helped Norm with some boat chores aboard. The young fellow is enthusiastic, to say the least. When it was time to go, he hauled the pram alongside, got aboard, and asked to row. The wind was blowing pretty hard. I said "Yes." Why not? He did it with a huge smile on his face. Norm didn't touch an oar. 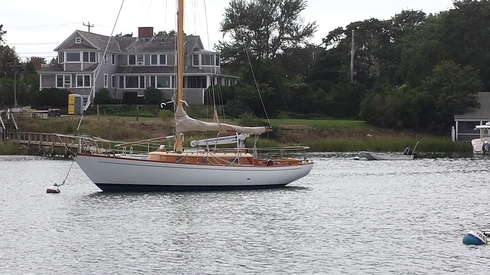 A Florida friend just got title to a Yankee 30 sloop located in Chatham. 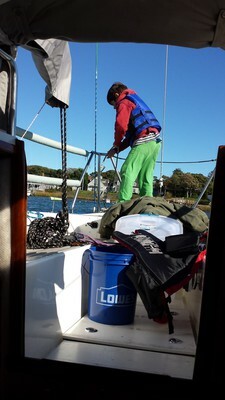 E and Norm helped out by carting the boom, sails and cushions from the former owner's house to the boat. It was a big job. This is half of the total job. Hope to see Wayne and his new boat cruising this next summer. Averisera: Close to the end! Thumper thumps. Water in tank. 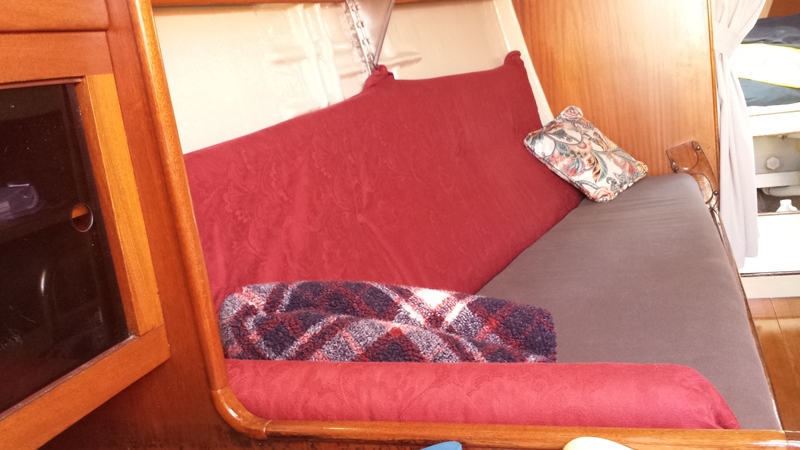 Berth cushions and decorative pillows installed. Surplus tools and fittings removed. Must be about done. The morning temperatures are around 40 at sunrise and above 50 at early afternoon. Chilly for cruising but we'll work something into the plan. Some pictures of where we are now. We are in Wychmere Harbor in Harwichport, MA. 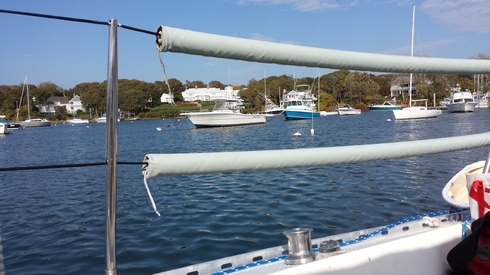 It is a beautiful harbor serviced by an outstanding boat yard. 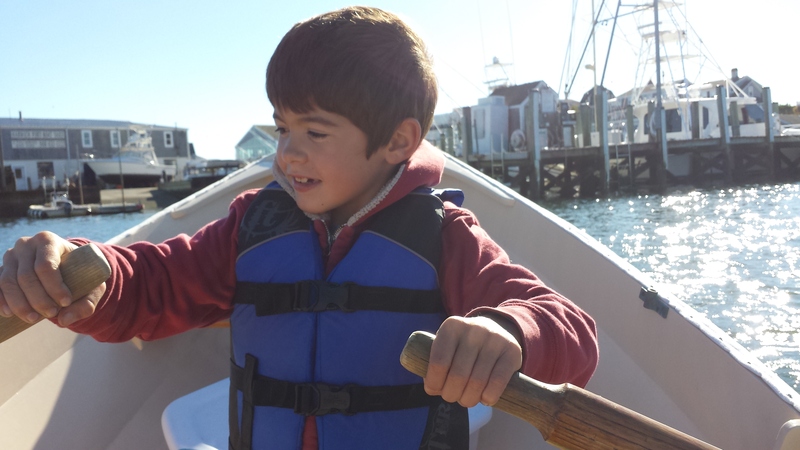 We have enjoyed working on the boat each day we can. A very nice place in which to busy ourselves with sailboat projects. The pretty interior finishing is all thanks to Elizabeth! No pictures. 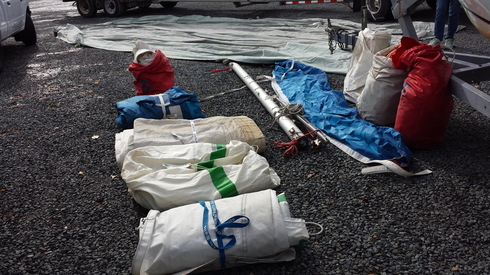 Thumper was installed aboard Averisera without incident. There was one teeny part missing, an o-ring for the injector. We could start and run the engine for a short time without it to check for the inevitable leaks of diesel fuel. We did. Then... today we got the o-ring. Installed same and fired Thumper up, tightened a few more fittings and got Averisera's diesel leak free. However... the shift cables showed their age a quit. New throttle and shifter cables ordered. While all this has been going on, Elizabeth has been beavering away on the various small electrical tasks. Small, ha! Sit cross-legged on the berth, lean forward into a small space and do a three handed job with two hands in the dark. 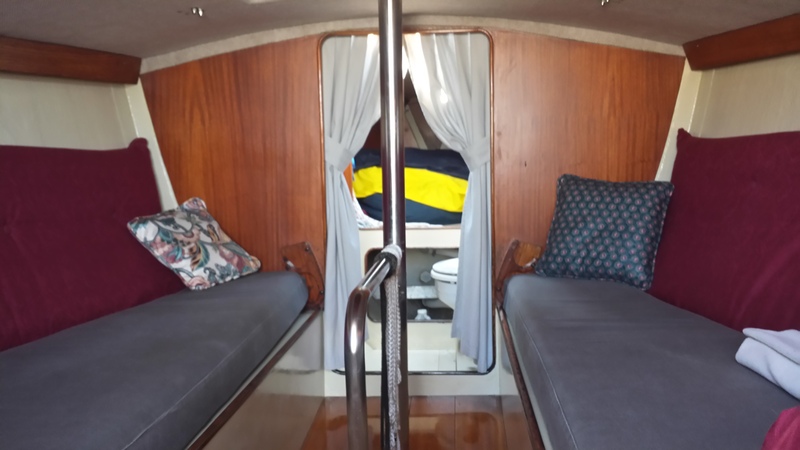 We placed two new berth lights in the quarter berths. In part to illuminate this area where we store a lot of cruising gear. In part to make reading lights for our grandchildren when they cruise with us. Never give up on your fantasy. On the 5th, Thumper was wheeled down the pier and hoisted into the "Boom-boom Room." Smooth as silk. We had just landed our Nutshell pram at the dinghy dock after an afternoon of puttering on Averisera when we looked up to see Dan and Zachary wheeling the diesel engine over towards the pier-head. Oh boy, all other plans on hold. We're not missing this! 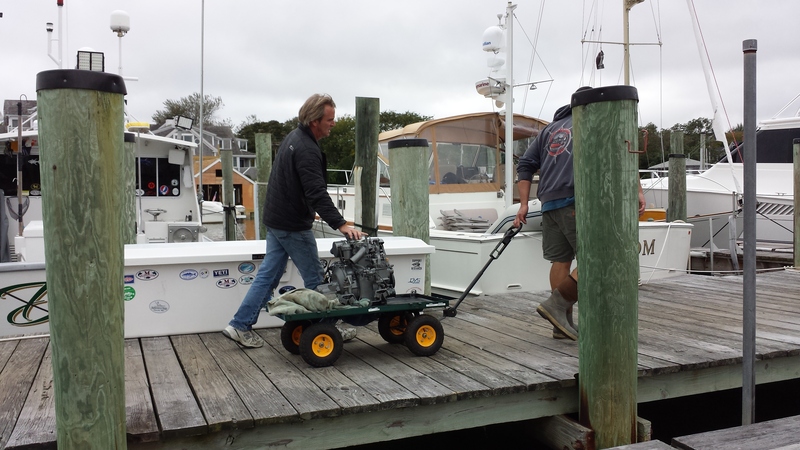 "Thumper" is our recently rebuilt 1984 Yanmar 1GM diesel. It produces 6.5 hp at 3000 rpms and weighs about 200 pounds. 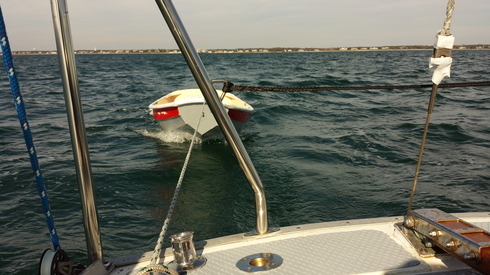 It pushes Averisera along at about 5.5 knots on smooth water. Thumper lives in the recently refurbished "Boom-boom Room." If you know anything about one cylinder diesels it is that they make a racket. The engine was rebuilt by Zachary under the watchful eye of master mechanic Ross. 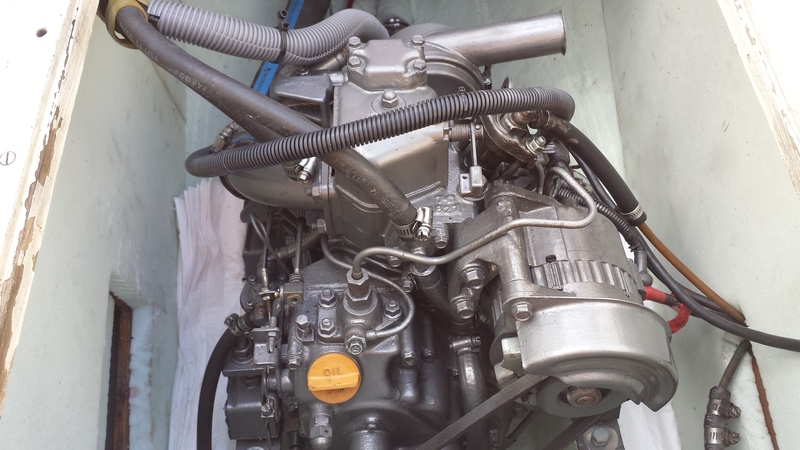 The engine is now pretty much as good as new. Thanks Ross for the good work on the engine and teaching Zachary a few new tricks. The Harwichport BY guys are really super. We hoisted the engine off the cart and lowered it into the engine space. Zach fitted the mounting screws and Thumper was preliminarily installed. 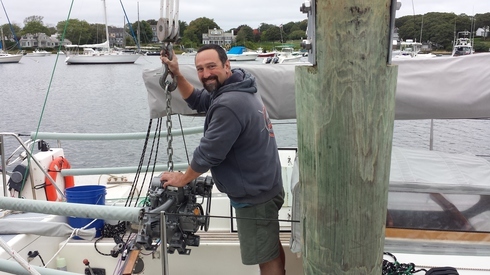 Jobs for today are to align the engine and connect the various parts such as wiring harnesses, hoses, and so forth. 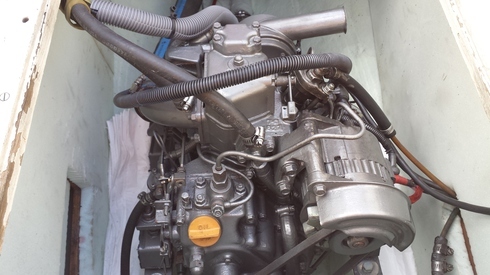 There are a couple of small pipes still to be received from Yanmar and installed. Simple to do while on board. A few days later, on October 10th, we had Thumper running for a bit until a vapor leak stopped it. Since we are awaiting the new fuel line pipes and will have to re-bleed the entire system, this isn't very important. Basically, the engine runs as expected.